The Salt River Canyon near our home in Globe, Arizona is a sight to see. There is a scenic drive that takes you through amazing viewpoints of the canyon and lake, along with a wilderness for you and the family to explore. 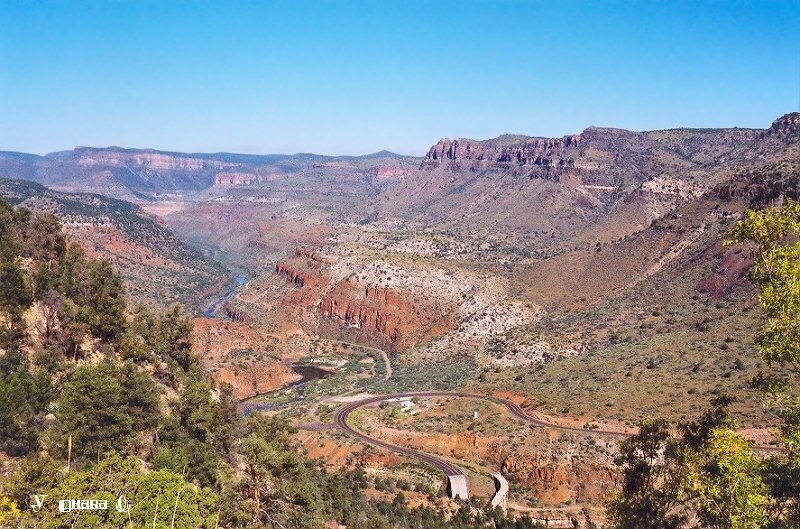 Follow the US 60 from Phoenix and soon you’ll arrive at the beginning of the Salt River Canyon drive. The trip is approximately 270 miles roundtrip from central Phoenix. You’ll see both forest and desert terrains along with lakes and small creeks. The road is curved into the cliffs with sharp turns and curvy pathways. Luckily, it flattens out along a high plateau that has amazing views. The exciting part of the Salt River Canyon Wilderness? There are no maintained trails—leaving the entire place free for exploration. The Salt River itself runs through the middle of the canyon and is visible from many points throughout the forest. The best way to travel through the river is by kayaking or rafting, as there are 27 sets of rapids ranging from low to high intensity. If travelling from March 1st to May 15th, you’ll need a permit to travel through the river. Here’s a link with more details: https://www.fs.usda.gov/recarea/tonto/recarea/?recid=35401. If you’re looking for a calmer stay – fear not! There are many side creeks, small recreational areas, and small hikes to wander to. Make sure to apply for a permit if you’re planning any activities with family. This tribal land belongs to the San Carlos Apache. Here is an informational link on permits from their website: http://www.sancarlosapache.com/Permits_Information.htm. You will pass through many interesting places on your journey. These include the Salt River, Seneca Lake, Hieroglyphic Point, and Besh-Ba-Gowah Archaeological Park. Make sure to also make a stop to Pickle Barrel Trading Post in Globe, Arizona. We’d love to see you!